How does someone live well over 100? What habits can help us live that long? Dr. Shigeaki Hinohara has the answer. This man has 104 and lives a pretty active life in Japan, and has written over 150 books during his career which offer advice on leading a long and happy life. Dr. Hinohara suggests always staying in shape. This means that you should stay physically active at all times and eat a healthy diet as well. For breakfast, he has a bit of orange juice, coffee and olive oil. For lunch, he eats cookies and milk, while for dinner, he eats rice, vegetables and fish. He also suggests eating 100 gr. of lean meat twice a week. Although a doctor himself, Dr. Hinohara says that following your doctor’s advices blindly won’t make you healthy, and may even have the opposite effect. 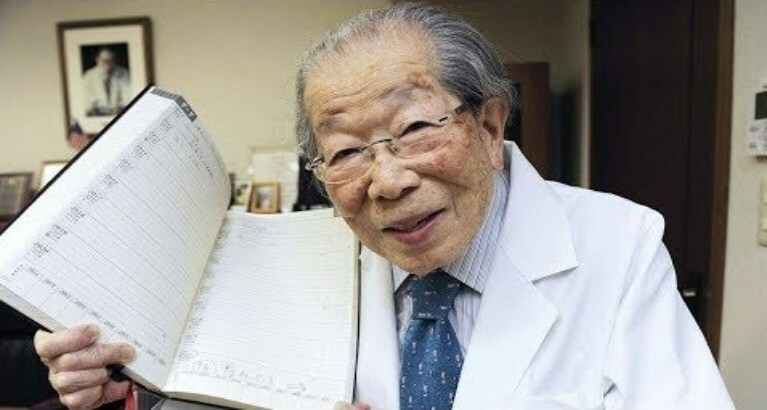 According to Dr. Hinohara, science alone won’t cure all diseases. He says that we must incorporate visual and even liberal arts in order to treat illnesses and stay healthy. Planning ahead can keep your brain health in check and help you lead a more successful life. Dr. Hinohara has already booked a spot at the 2020 Japan Olympics! According to the doctor, pain is mysterious and can be treated with simple things such as playing with your pet or listening to music. In order to stay motivated, you should always seek inspiration. Dr. Hinohara knows how to enjoy life. He still works for about 18 hours a day, and serves the community in every way he can. Taking the stairs instead of the elevator can keep you in shape and prevent a variety of health problems. Dr. Hinohara says that life is an unpredictable chain of events, so we must stop worrying about things. This will only lead to depression and more problems, so make sure to stay positive. Dr. Hinohara travels around Japan every year and gives more than 100 lectures to people around the country. He always makes the audience stand up instead of sitting down, and he always gives his lectures while standing, even at the age of 100! Chasing money all your life won’t get you anywhere. Plus, you can’t take your millions where you’re going in the end. Dr. Hinohara says that you need to have a role model in life in order to be successful. Whenever he has some kind of problem, he asks himself “What would father have done?” This helps him get the answer quickly and resolve the problem he’s facing. If you’re in good mental and physical shape, you don’t have to retire. Work as long as you can in order to lead a happy and successful life. You will be more happy and energetic if you eliminate strict time-regulated rules, be like children, have a lots of fun until you feel sleepy or hungry. Follow the good doctor’s advices and we’re sure you’ll lead a fulfilled and happy life.